It’s a long, long way from Cambridge to the galaxy known as Cosmos ID 42 (4 billion light years, give or take). But with the help of a couple of powerful telescopes, Harvard-Smithsonian astronomers have made a discovery about a black hole, colliding galaxies, and an eviction, all unfolding just as Einstein would have predicted. A black hole speeding away from its home galaxy like a pebble from a slingshot might seem like a mere curiosity. But researchers were looking for just such an anomaly, the kind of cosmic aberration that could provide key support for Albert Einstein’s nearly century-old theory of general relativity. A typical galaxy, including ours, has a black hole at its center. 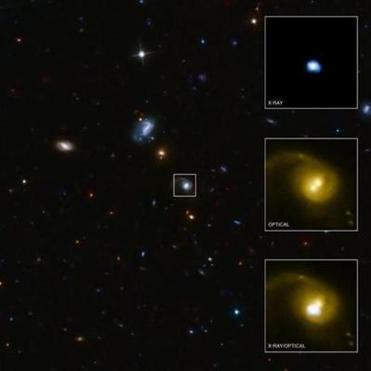 When two galaxies collide and merge, the black holes at their centers generally follow suit. The idea that coalescing black holes could be ejected powerfully out of the center of their galaxy was an idea that followed from Einstein’s prediction that there are gravitational waves, ripples in the fabric of space. When black holes merge into one, they emit gravitational waves. Under the right conditions, the merged black hole could be punted out of the galaxy. But scientists have not yet been able to detect gravitational waves directly, so they could only ­locate them by scouring catalogs of galaxies to determine if they could find an ­example of such a rare phenomenon in action. “These were theoretical calculations: People predicted a black hole can get a kick that will expel it from the center of the merged galaxy, but we had not seen evidence for it,” said Avi Loeb, chairman of the ­astronomy department at ­Harvard University. “What would be a smoking gun would be to see a black hole not in the center” of the galaxy, he said. The search for such a galaxy lit on Cosmos ID 42, where something unusual seemed to be unfurling. There, using telescopes — including NASA’s Hubble Space Telescope, ground-based observatories, and the Chandra X-ray observatory — the researchers saw strong evidence of a black hole barreling away from its home address at several million miles per hour. The new finding, to be published in the Astrophysical Journal later this month, opens up plenty of new questions, said Francesca Civano, a postdoctoral researcher at the Harvard-­Smithsonian Center for Astrophysics who led the work. Are there other errant black holes, ejected from their homes and wandering the universe? What effect would losing a black hole have on the continued evolution of the galaxy? And, of more earthly concern, what of our own galaxy? Loeb pointed out that the Milky Way has a black hole at its center, too. And the Milky Way is on a collision course with the neighboring ­Andromeda galaxy, which has its own black hole.